Jay Osting has been consulting with BSC for nearly 10 years now. 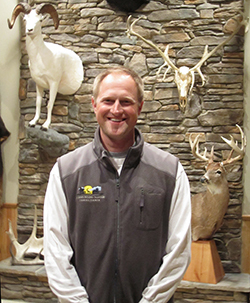 The first half of his career he primarily focused on developing whitetail and wild turkey outfitters for BSC clients. Jay has successfully assisted hundreds of BSC clients focusing on whitetails throughout the lower 48, Canada and Mexico, as well as all species of turkeys. During Jay’s 10 years he has traveled & hunted extensively throughout North America including seven Canadian providences, including Mackenzie Mountains for sheep, Nunavut and QBC for caribou, moose in NF and BC, goats in Alaska, bears in SK, Alberta and Alaska and most of the western lower 48 states for other species in North America. Jay’s is now closing in on his “super ten” in hopes to have this milestone completed in the near future. Jay has introduced his wife, Cindy, to bowhunting a few years ago and they’re daughter, Claire, also is showing signs of a hunter. Jay and Cindy are members of the Pope and Young Club, SCI and other local bowhunting organizations. Both have authored in BOWHUNTER MAGAZINE for Turkey and Deer hunts. Jay has been active in using his spare time to promote hunting and fishing to youth programs through state and local programs.